If you're staying at Lucker, why not take the opportunity to walk the stunning Northumberland countryside with Patrick Norris, a professional walks guide who is completely besotted with the area? The walks that Patrick offers are exclusive to those staying at Lucker Hall and they run continuously throughout the year – as long as the weather isn't too treacherous! So whatever the season, you'll be able to venture outdoors and discover the surroundings. 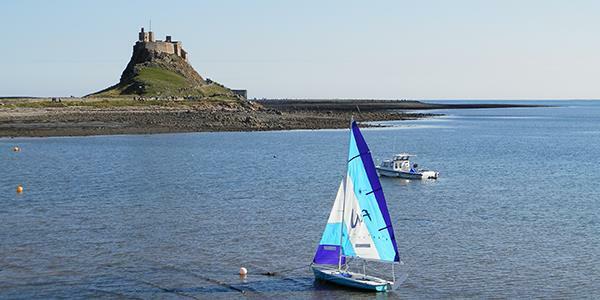 What makes Northumberland so special? Patrick's family has been based up in the Borders since the 1960s and he knows this area of the country really well. He's passionate about all that the area has to offer and weaves his knowledge of the history and the wildlife into his fantastic walks. He's been a guide since 2003 and his business Footsteps kicked off in 2011. You can take a look at his website here. Northumberland is famous for its castles, its coastline and its wildlife. Northumberland National Park, with its hills, valleys, moorlands and woodlands covers 400 square miles, stretching from the English/Scottish Border to Hadrian's Wall. The variety and diversity of habitats supports everything from tiny invertebrates to the rare wild Cheviot goats that roam freely across its hills. Each season brings something new to see. Autumn is the best time to spot all the migrating geese that fill the skies on their journey from Arctic breeding grounds. And the winter months bring tens of thousands of migrating ducks and waders to Northumberland's rich shores, where there is plenty of food to keep them going. In fact, a huge 100 miles is designated as a coastal Area of Outstanding Natural Beauty and is home to seabird colonies, wildfowl, seals and other marine species. There are a lot of nature reserves both along the coast and throughout the countryside.You'll be lucky enough to spot something at all times of the year and Patrick admits that the height of summer is his favourite time to walk: the landscape is alive with heather moors and fields of wildflowers and the days stretch right on into the evening when the sun sets as late as 10pm. One leads you around the Holy Island of Lindisfarne. Once a hub of Celtic Christian worship, the island was to become the destination of the very first Viking raids in 793 CE. 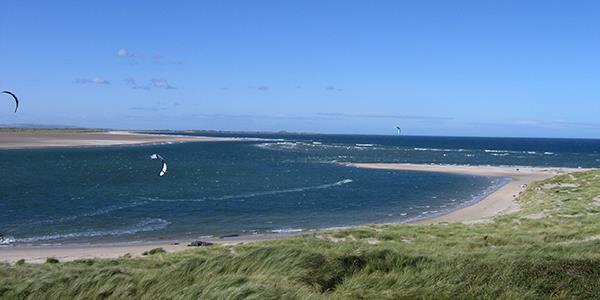 A second leads you north of Bamburgh Castle, along the wilder side of the Northumberland Coast. Between Craster and Embleton, the final of the three travels via the iconic Dunstanburgh Castle and some incredible dune-backed sandy bays. Have a chat with Patrick while you're at Lucker and hear about all the walks he offers to see which one you like the sound of. The great thing about Northumberland, thanks to its turbulent history, is that the countryside is peppered with stunning fortifications and interesting buildings. Being so interested in the area's history, particularly Anglo-Saxon Northumberland, Patrick is always sharing his knowledge with his groups. He'll point out wildlife, explain about land use, farming and early Northumberland history. You'll pass a range of cultures and all sorts of nature as you're exploring and will pick up interesting facts too. Patrick makes sure there is always a tearoom or pub either part way through the walk or at the end. So you don't need to worry about a pit stop! The walks are really popular and give you the chance to discover parts of the landscape you otherwise might have missed. Thank you to Patrick Norris for use of his photos. Header picture is Pilgrims' Way, the traditional path between the mainland and the Holy Island of Lindisfarne, photographed at sunset. To discover how you too can stay at Lucker Hall and see this stunning landscape simply enter your details at the bottom of the page to receive a free brochure.